Over the last decade, the development of renewable energy sources (RES) has taken place at a pace that outstrips any other sources of energy. REEs have reached a certain level of maturity and greater financial attractiveness than traditional technologies. However, progress in the implementation of RES is still not the same across countries and sectors of the economy; there is an opposition to both for regulatory, financial and technological reasons, and in view of the integration of new sources into existing energy. The problem of rationalizing the implementation of RES policies, especially variable renewable sources (VREs), and the relationship between the degree of autonomy and the integration of new capacities to the overall network at the national, regional, and local levels requires careful attention. World electricity generation has increased by an average on 2.8% per year over the past 10 years (BP, 2018), and in 2015 it reached 24.1 thousand TWh (IRENA, 2017), and in 2017 already exceeded 25 thousand TV · g. The global power structure now consists of RES for almost a quarter, see. Fig. 1. Renewable energy production in 2009-2014 increased with an annual average growth rate of 6.4%. Today, the largest consumer of electricity still remains the industry (42%), followed by residential and commercial real estate in the second and third place respectively – 27% and 22%. The tipping point in favor of new generating capacities from RES was when investments ahead of financing in new fossil power generation, occurred in 2012 (see Figure 2). Fig. 1. Global generation of electricity by generation type. Source: IRENA "Renewable Energy Policies in a Time of Transition", 2018. Since that time, the issue of combining renewable and conventional generation in a single grid has become quite acute, especially while having a look that the most investment-attractive types of RES – PV and wind power plants – relate to variable renewable power generation (VRE). Fig. 2. 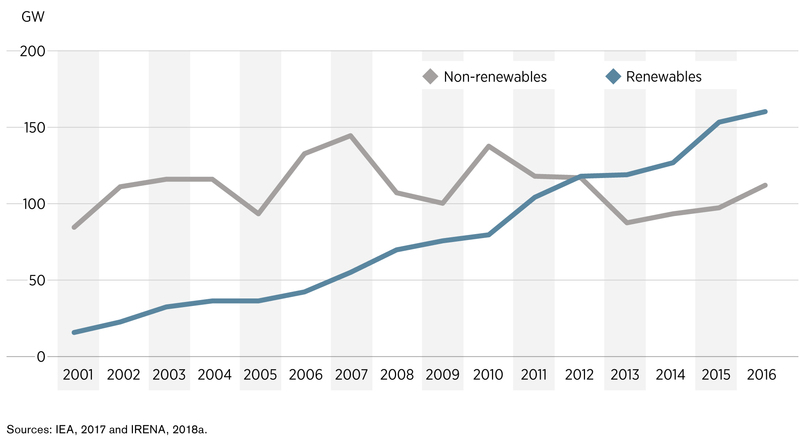 Dynamics of new power generation from renewable and non-renewable sources, 2001-2016. Source: IRENA "Renewable Energy Policies in a Time of Transition", 2018. Small short-term implementation costs. The mounted VRE generators produce energy with low operating and additional costs. The sun or the wind, due to its economic attractiveness, squeeze out other technologies with larger initial investments (including other RES). Variability and instability. The output power of the VRE system varies depending on the instantaneous availability of the resource. The power system has to compensate for this variable component, which requires additional investments in operational voltage and frequency control to maintain current network quality. In addition to cyclicity, the inherent unpredictability of VRE generation itself is causing an imbalance of energy supply / demand in the network. Therefore, the grid should be able to operate quickly by compensating for the power of other technologies, and have equipment for energy storage and rapid dispatching. The unpredictability requires forecasting. Currently, generation of forecasting systems from VRE sources have limited short-term planning capabilities, especially within up to one hour; this affects the determination of the need for reserve power system and the efficiency of their use. Limited location. VRE resources are not equally well localized and can not be transported over a considerable distance, like fossil fuels or granular biomass. Placing VREs exactly in the places where energy demand is the greatest may require significant rebuilding of the local infrastructure of the grid, and therefore targeted investments, which may be significant or even innumerable. Also, new infrastructure capacities will be needed for rapid operational control and the rollback of large volumes of electricity at least at the regional level. Modularity. Wind and solar stations consist of separate wind turbines and solar panels, which can be deployed in various sizes, from powerful parks to individual turbines or solar systems at home to modules on poles for lighting. Small stations can be connected in allocative networks at lower levels of voltage (mini-grid) compared to high-voltage lines, which will require changes in the way they are configured and operated. Non-synchronous technologies. Synchronous generators are electromechanically connected to the power system and have a significant rotational mass (inertia), which positively affects the constancy of voltage and frequency in the network. VRE settings are connected to the power system of power electronics, which has no inertia mass, as in synchronous generators. It may require changes in the management of the stabilization system. The extent of occurrence to these needs depends on the fate that the VRE occupies in the system as a whole, and on its “flexibility”, that is, the degree of adaptability of the system and its ability to continuously balance supply and demand to equalize the volatility of seasonal, daily and hourly electricity demand, as well as to absorb the effect of unpredictable failures of individual generators and accidents on power lines. The UN Program has set the goal of sustainable development in the world with the widest availability of reliable and modern energy sources to the population (SDG 7, UN, 2018). This goal, together with ecology, is connected with the steady development of the economies of the countries and the elimination of poverty. Distribution of dispersed energy sources, small network solutions (mini-grid) and off-grid systems contribute to this fairly well. According to IRENA, more than 133 million people are already having access to lighting and home-use of electricity through their off-grid RES-solutions, see Fig. 3. 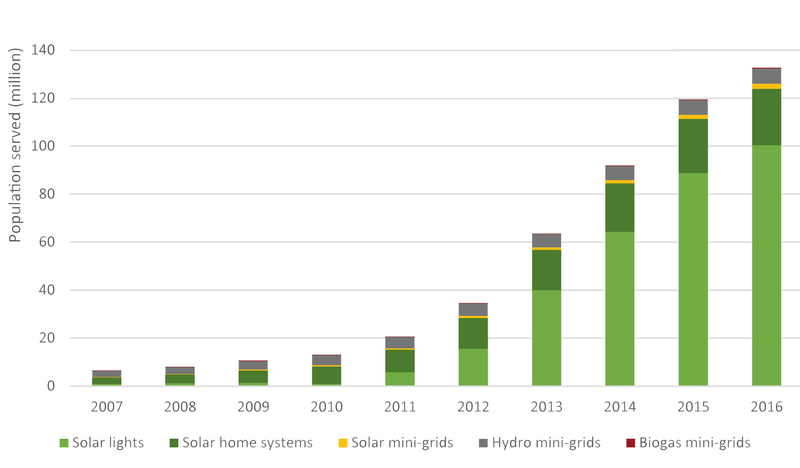 Out of these, 24 million are using home solar autonomous PV systems, and at least 9 million are connected to local mini-networks. Almost 95% of all these systems are just PV solutions. Fig. 3.World`s popultion, using energy from autonomous sources and local mini-networks. 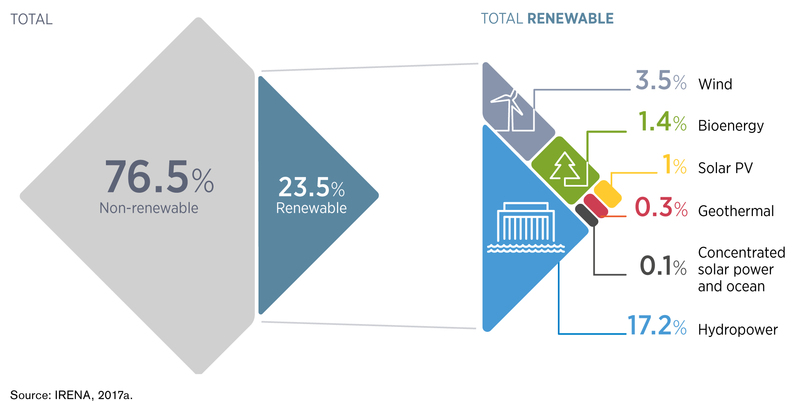 Source: IRENA Off-grid renewable energy solutions, 2018. 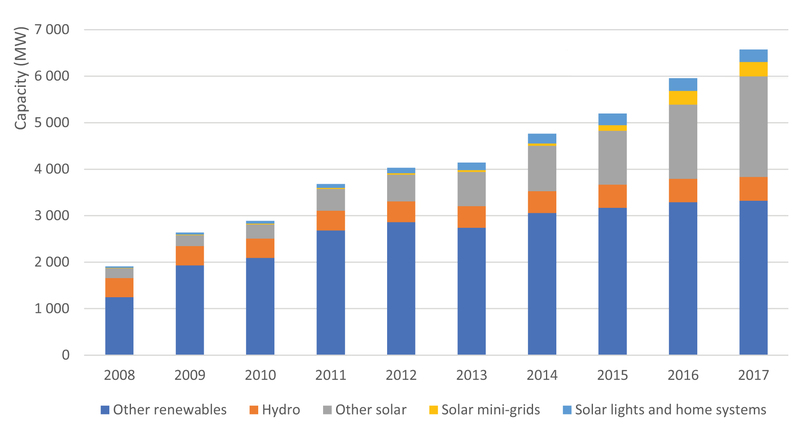 The total installed power of off-grid RES-solutions increased from 231 MW in 2008 to almost 1.2 GW in 2017 (see Figure 4). Due to the accelerated implementation of PV-technologies, autonomous capacities up to> 820 MW increased. Exactly the direct transformation of solar energy into electricity, at present, is not the most profitable option for the provision of electricity in areas that are not sufficiently covered by a stationary electricity grid. Fig. 4. Installed power of autonomous sources and local mini-networks in the world. Source: IRENA Off-grid renewable energy solutions, 2018. To the category “other solar sources” in Fig. 4 assigned power for off-grid power supply in end-use sectors such as industrial and commercial / public institutions. In addition, IRENA at the end of 2017 has about 1.5 GW of autonomous solar PV power, the end-use of which is unknown, and therefore it has been included in this category. In addition to electrification, off-grid power for self-sustaining energy needs in industry (for example, cogeneration) increased from 29 MW in 2008 to almost 200 MW in 2017. IRENA experts are considering the broadest autonomy of energy supply and the use of another dispersed generation as a factor in accelerating the global transition to a new type of energy based on RES. Distribution and autonomy of generating capacities primarily reduce the problem of VRE load on an existing grid. Over time, these offshore facilities will gradually be combined with centralized electricity grids, when building new networks or upgrading of existing lines along with new compensating equipment will have some economic meaning in the area. Reducing the level of problems from the implementation of VRE generation to the general grid is also the broadest simultaneous use of various technologies RES, including combined options. The policy of the broadest replacement of hydrocarbon sources for heat / cold production should play a key role in the overall energy decarbonisation. For example, heating consumes more than 50% of primary energy, and now it is almost 70% – energy from fossil fuels. At the same time, the joint use of the scheme “heat pump / RES-electric power” reduces electricity consumption several times irrelevantly, whether the autonomous or networked, or partially connected to the network solution were involved. The support policy stimulates the sharing of VREs, especially solar thermal installations along with PV generation, which also support the development of each other in the construction sector. However, the industrial, commercial and residential real estate sector is very slowly replacing conventional technological solutions for heating, so public policies should be involved. Table 1. Categories of policies for providing access to power supply using mini-networks and autonomous RES systems. Source: IRENA "Renewable Energy Policies in a Time of Transition", 2018. Tax and financial incitements are now even more important than legislative compulsions by the state. Often, they are used in parallel with the tariff regulation policy and consist of improving access to capital, reducing financing costs and burdening high initial loan costs for large RES projects, sometimes combined with energy efficiency incitements, etc. Financial incitements can be applied in the form of tax privileges, grants, stimulation of achieved results, preferential lending, provision of guarantees for risk reduction. In fig. 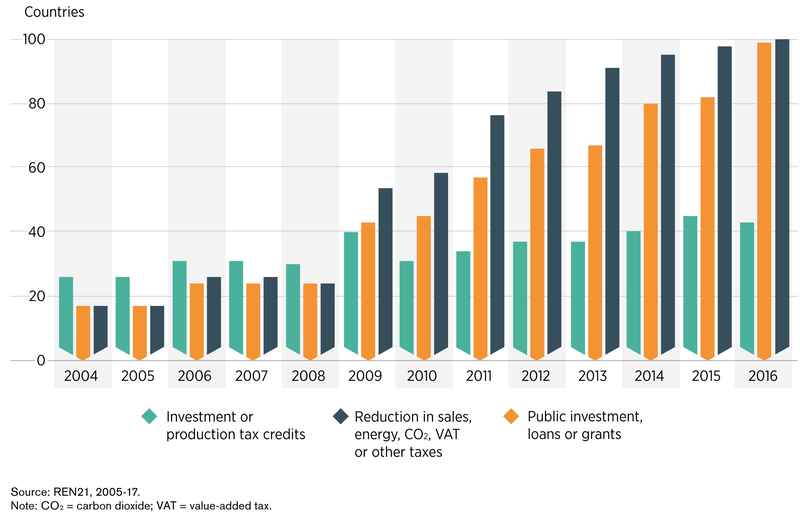 5 it is shown that the creation of attractive conditions for the public financing of RES projects is now applied in tandem with tax instruments. Fig. 5. World trends in applying financial and fiscal incitements for implementation of RES, 2004-2016. Source: IRENA "Renewable Energy Policies in a Time of Transition", 2018. The policy of using VRE electricity sales auctions contributes to a significant reduction in prices in a competitive environment, especially for large energy producers. However, using only this tool may overlap access to small and medium-sized producers with relatively higher costs, and therefore other incentive tools should be used for them. For example, it may be stimulating tariffs for different power stations. The incentive policy should be stable and transparent. Although there are a lot of problematic issues (among them subsidies to fossil fuel production, including coal are not at the last turn), a more sophisticated and developed incentive policy adds prospects for the development of RES. Consequently, according to IRENA, there are no significant contradictions as to which systems have the priority of implementation – a network or stand-alone, partly autonomous solution, or on what technology. Moreover, the acceleration of the world energy transit is possible only if all types of RES are best utilized, which are best localized, and using all the tools to increase the attractiveness of investment.